Central HafenCity with Überseequartier and the surroundings of Magdeburger Hafen was designed by the renowned Catalan landscape architect Beth Galí and her firm BB + GG Arquitectes (Barcelona). The vitality of the area around Magdeburger Hafen is increasingly melding HafenCity and the existing city center together. After all, the Inner Alster is only 900 m away and thus just a few minutes’ walk from Magdeburger Hafen, interconnected by the central Domplatz axis. Inside HafenCity, this links Überseequartier, Elbtorquartier and Brooktorquartier, for instance via the historic Busanbrücke bridge, reopened at the end of 2010. Along Osakaallee, an embankment promenade up to 12 m wide borders the western side of Magdeburger Hafen. Ramps, steps and clumps of green shrubs lead down from the new road level onto the historic quay level. Nestled in the difference in elevation is the Osaka 9 sustainability pavilion; the ecological aspects of HafenCity have been exhibited here since 2011. At the head of Magdeburger Hafen is the most important entrance to central HafenCity, Dar es Salaam square, an attractive place that faces south to the harbor basin, with sweeping views to the Elbe. The León-Brücke bridge links the square with Brooktorpromenade, opened 2010 and leading alongside the DNV Germanischer Lloyd building ensemble to Ericusspitze and the Spiegel building. A special design feature here is the 30 m stone “sofa”. WES & Partner Landschaftsarchitekten (Hamburg) were responsible for most of the design of this open space. The Ericuspromenade, the continuation of Brooktorpromenade, ready since fall 2011, is an invitation to change levels. On the eastern side of Magdeburger Hafen, the promenade has led along the new Elbe Arcades on two levels since fall 2013 – by the water via a new pier with an integrated jetty for tourist barges and at the flood-protected warft level – continuing beside the harbor basin down to the new HafenCity University building. 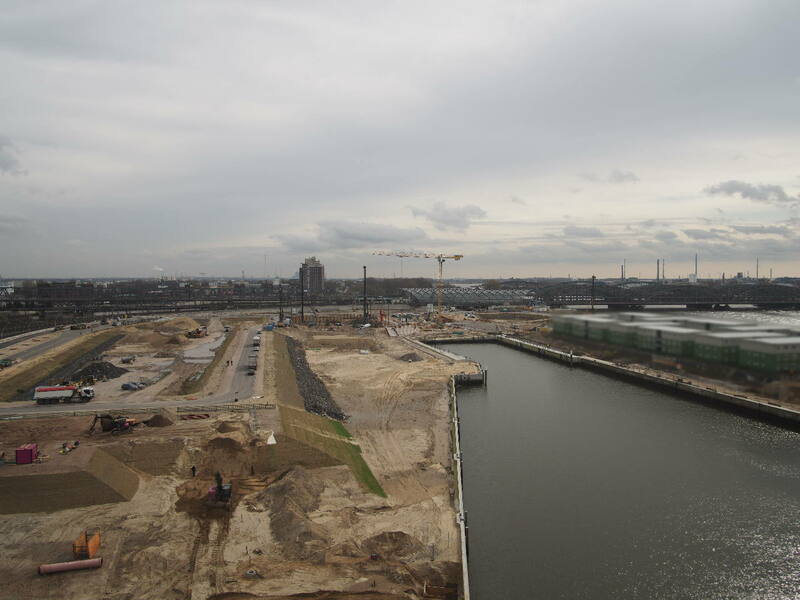 This now links the square in front of Kaispeicher B with the open spaces at HCU since, as of August 2014, the pier has continued southwards under Magdeburger Brücke bridge through to Lohsepark, Baakenhafen basin and the Elbe, offering a through route without crossing any roads. With their closeness to water, these promenade underpasses running beneath the higher bridges – Baakenhafen, Shanghai or Magdeburger bridge – are an outstanding functional feature of HafenCity. They provide excellent links between the various spaces by the water.